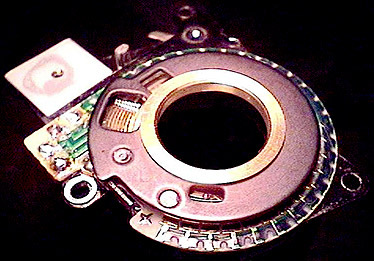 This text is an attempt to identify and explain common Pentax LX faults. I have owned over ten Pentax LX bodies, my earliest since 1987, some were used sporadically, others were treated to an often heavy daily workout. Some were stored and not used yet all have exhibited the frustrating sticky mirror/shutter fault seemingly independent of their storage or use. The problem generally occurs in early LX bodies, and is witnessed as a prolonged or incomplete mirror/shutter cycle. Often the delay is most pronounced the first time the shutter is tripped after the camera has been idle for a day or so (or in severe cases for as little as a few hours). Sometimes the shutter/mirror jams for a few seconds and then releases of its own accord. As the problem matures the shutter/mirror regularly has to be forced to complete it's cycle by rotating the shutter dial to a mechanical shutter position or jarring the mechanism by pushing the multi-function lever to the mirror lock position and then immediately releasing it. An advance indication of 'Sticky mirror' syndrome is often experienced as the slow creep of focus errors in prints and slides. I have heard of several cases where the ensuing frustration and doubt about ones manual focus competence has lead to the purchase of an auto-focus body or even a P&S :-( See the later section More symptoms for details. Some years back I spoke about the problem with a Factory Authorised Pentax Technician, Ross Perkin of CR Kennedy & Company Melbourne (the authorised Australian Pentax distributors). Ross has repaired and aligned many LX bodies for me, he knows the LX and it's failings intimately. He indicated that he trained in Japan with Pentax to repair the LX and suggested that he also spent time at the LX production line during this training. Following below is my distillation of the problem based on discussions with Ross. Within the shutter mechanism and mirror box there are elastic rests that are designed to support, protect and dampen the shutter and mirror mechanism components in their rest and limit positions. These rests were designed to have elastic properties in order to dissipate mechanical shock. However over time and subject to environmental conditions they deteriorate, losing their elastic properties, eventually becoming sticky and deforming. As the levers etc. in the shutter and mirror mechanisms are designed to have a small residual or holding force at their rest positions they tend to sink and embed themselves in the sticky deteriorating elastic rests. The problem seems to be age related generally with acceleration of the condition brought about where the cameras have been subjected to tropical or sub-tropical climates. There seems to be little relativity to the level of use as LX bodies in storage tend to develop the sticky mirror/shutter problems at a similar age to bodies in heavy use however the problem may be less apparent. A small rest can be seen screwed to, and protruding from the wall of the LX mirror box when the mirror is locked up. The surface of this rest is covered with a pad of elastic material and generally if the shutter is sticky this pad will also show signs of deterioration and have become slightly compressed causing focus inaccuracies. When the mirror rest becomes compressed the mirror is effectively supported at a lower position which alters the plane of focus at the finder screen relative to the film plane. The effect can be seen when photographs captured at wide apertures show a plane of focus in front of the subject which was selected as the plane of focus through the finder or if infinity focus cannot be obtained through the finder. Also in some instances if the camera has not been used for some time the mirror assembly may bind to this rest during the first release of the shutter. In bodies exhibiting the problems mentioned above you may also find that your LX's reflex mirror may be contaminated by sticky black greasy deposits which is generally the product of a deteriorating expanded foam gasket found around the perimeter of the top of the mirror box. Cleaning the mirror should probably be left to authorized repairers since the mirror surface is easily damaged and the contaminant readily spreads. Contamination of or damage to the mirror surface may affect the finder view and the manual metering accuracy. Another problem that has been mentioned and in some instances mistakenly related to the sticky mirror/shutter problem is; intermittent or erratic meter reading and/or unpredictable shutter timing (not including OTF exposure timing variations due to lack of film) which can sometimes be resolved by rotating the ISO/exposure compensation dial. The LX ISO/compensation dial is a multi-position switch that constist of a glass-epoxy printed circuit board printed with concentric gold plated contacts and set of gold plated contact wipers. The wipers are positioned to be in contact with the board and to rotate with the ISO/compensation dial. The printed circuit board contacts are connected to a series of printed resistors which provides discrete resistance steps relative to the angular position of the ISO/compensation dial. The ISO/compensation dial assembly is similar in construction to an audio amplifier input level attenuator which, if affected by dirt or corrosion, can cause electrical noise leading to audible clicks and pops. Similarly unwanted deposits on the contacts of ISO/compensation dial switch may lead to distortion of the exposure measurement signals sent to the exposure computer which can translate to unreliable automatic shutter programming. The Pentax LX exposure system is very sensitive and has little damping (a very fast response time) so it can be easily disrupted due to the generation of minute noise signals through the vibration of dirty electrical contacts during the release of the shutter. One solution to displace contaminants is to hold the ISO lock button depressed and repeatedly work the ISO/compensation dial back and forth through it's full degree of movement for a few cycles. This action may clean the contacts sufficiently to restore reliable operation, if not then the assembly contacts may be irreparably damaged, the only solution then is repair. Damage can occur through exposure to moisture, excess wear and occasionally the circuit board or printed resistors can develop an intermittent hair-line crack through physical abuse. On nearly all the older LX bodies that I have used the multi-function release button has lost or is losing it's black paint. The newer bodies seem to have a different paint texture and none that I have seen have yet been missing paint from the multi-function release button. I have had several LX bodies where the mirror lock on the multi-function release button has become unreliable in that it becomes difficult to get the lever to remain in the mirror locked position. On well used bodies the leatherette tends to harden, curl and then part company with the body panels often in the areas where they are subject to grease from fingers, cheeks and noses etc. Luckily the leatherette is easily replaced on front of the body however if the problem is with the back the the entire camera back must be replaced as the film note holder is plastic welded to the metal of the back. If a precessed film displays inconsistency in the width of the gaps between adjacent frames this may indicate the need for costly transport repair. In some cases this problem is also accompanied by a rough feeling through the advance lever that can be noticed when advancing the film. Another type of failure is that the metering can be activated whilst the shutter release is locked, in some cases an attached winder or drive might also be falsely triggered. When this happens even a minute continuous pressure on the shutter release button can cause batteries to become quickly depleted. Secondarily if depleted batteries are left in the camera for an extended period of time the battery compartment and possibly the mechanics or electronics of the camera may become damaged. Adjustment by a technician is required to solve this problem. I have been unable obtain information to confirm that Pentax have successfully addressed the matter of the long term stability of the material chosen for the replacement elastic rests but in any case all the bodies that I have had repaired have not displayed the problem again. Neither am I aware of any reports of newer bodies displaying symptoms of the 'Sticky mirror' syndrome. My hope is that this document minimises the anxiety of prospective LX buyers and encourages LX owners with problematic camera bodies to find a technician and have their LX restored (also to encourage Pentax to keep the supply of spare parts rolling for the mean time). It is difficult to beat the LX's compact size, system flexibility, TTL features, advanced construction, mechanical precision and understated appearance. The LX was released in 1980 and years later it is still a very capable, well conceived, widely used and respected photographic tool. I have had what I call type1 - the mirror doesn't move from rest immediately, accompanied by lack of infinity focus. Fixed very cheaply, locally. Last week I had a session of what I call type 2 - mirror rises and stays risen. This was odd, however, as when I turned the shutter speed dial from A to 2000, the mirror fell immediately. Return to A; it sticks. Try it at manaul speeds and it doesn't. The penny dropped when I tried it at speeds below x-synch. It stuck again. Despite the LED's showing bright, clear and unflickering, a change of batteries cured the problem. My LX was sent to the Pentax folds in Colorado but is now doing it again. Doesn't do it at all speeds usually around 30 to 60. But I have to move the dial for it to release. Any further information you might have will be most gratefully appreciated. The camera is a joy, but damn frustrating. The text contained in this document represents my opinions only, and as such I will not be held liable for detrimental consequences that arise from the application of any information within or relating to this document. All references to trade marks and or trade names are acknowledged as belonging to their respective owners. This complete document may be copied, re-posted, linked-to or used within other publications providing that permission from the author is sought and granted and that there exists a visible reference to Rob Studdert as author in any referring text. I am not a camera technician nor do I represent Pentax or their affiliates.